Part of the reason that we chose the weekend that we did to visit Neel's family in Atlanta was that Callum's beloved Phillies were in town playing the Braves. It was one of the highlights of the trip. We got there early, before the gates opened even, and splurged on some seats right on the first base line. Even though the away team sits along the third base, Callum's favorite player plays first base, and we wanted to get as near as possible. Getting there early means you get to watch batting and fielding practice from up close. That's Cal, in the "Howard" jersey, watching Roy Halliday, his favorite pitcher. Halliday wasn't pitching that night, so he could hang out and shoot the breeze. I love the way the players from opposing teams chat before the game. They've likely played together before and have stayed friends. It's like Little League. Our guys got off to a hot start. My favorite player (Shane Victorino, based primarily on how nice he is in his twitter feed, and yep, he's been traded now. Go Dodgers!) hit a double and scored a run, but that was about all we had in us. It's been a rough year for the Phillies. Hard to take after going almost all the way last year. Once the score got out of hand, we concentrated on other stuff, like watching how fast the security guards slide in and out of the stands between innings. Turner Field is a great old baseball field. Between batting practice and the start of the game, we got dinner at a burger joint and shared a picnic table with a Braves family. After the expected good-natured trash talking, the guy we were sitting with told us that the Braves have worked to turn Turner Field into the most fan-friendly stadium in the country. If you're a Chicago fan, you can get a deep-dish pizza. If you're a Phillie fan, you can get a cheesesteak. Because of the nature of Cal's favorite teams, we are most often away fans, and I can easily say that the experience we had in Atlanta was our best away game yet. When Neel stopped to get a beer the vendor looked at me and said, "I know just what you need!" He took a large square paper towel and doused it in the ice he used to house the beer. Bliss. It stayed cool and wet for most of the game, and on that hot and muggy summer evening, not much felt nicer. Our seats were right behind the bat boy, and what a job that must be! The pressure of having fans yell at you all the time all but compensated for by getting to toss balls with Major League Baseball players. We love the Atlanta Braves Bat Boy. 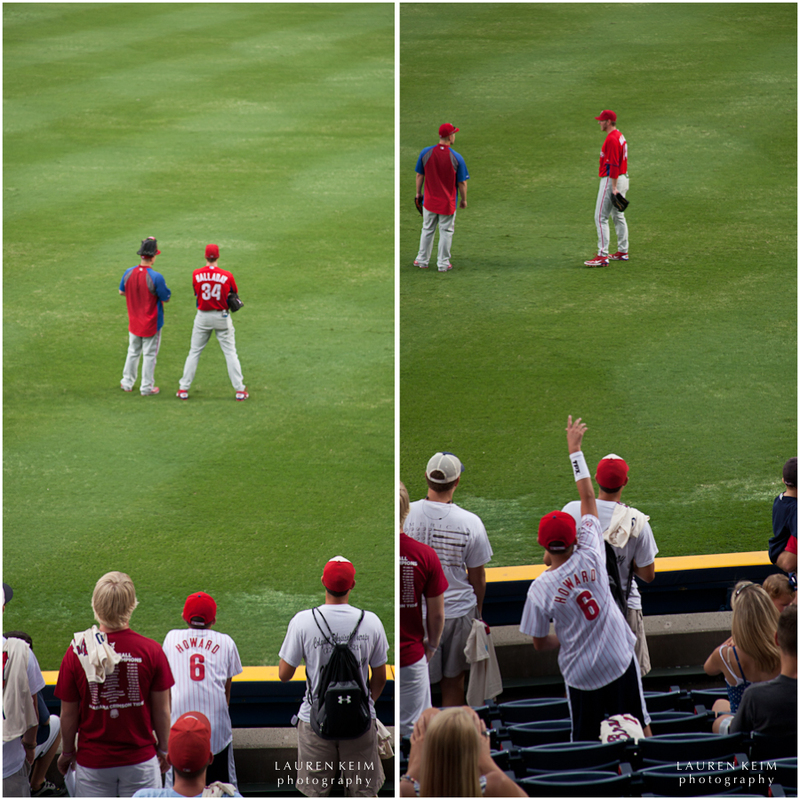 Chase Utley, one of the Phillies stars, hit a foul ball, and the Bat Boy picked it up, scanned the crowd and tossed it to my kid. Look at that smile. Win? Lose? Who cares? Seeing my boy so happy that night, from start to finish. A mama couldn't ask for anything more.